The current study aims to investigate 1) the collaborative condition between public sectors and community organisations to inhibit the insurgency in the unrest areas of the southernmost provinces and 2) the causal factors which are influential on collaboration between public sectors and community organisations to decrease the violence in southernmost provinces. The sampling groups comprised of community organisations namely leader, committees, or members who are assigned as the representatives of the organisations in southernmost provinces including urban and rural areas. 200 participants were selected by using simple random sampling. The findings led to the following consequences. 1) The collaborative condition between public sectors and community organisations to suppress the insurgency in southernmost provinces took place by coalition among organisations in accordant with the objectives of the government in an attempt to promote peaceful living. 2) Influence line showed statistical significance at .05, and the measure of agreement was acceptable. The last model was calculated as c2 = 583.73, df = 283, c2/2 = 2.06, CFI = 0.91, RMR = 0.06 and RMSEA = 0.07. 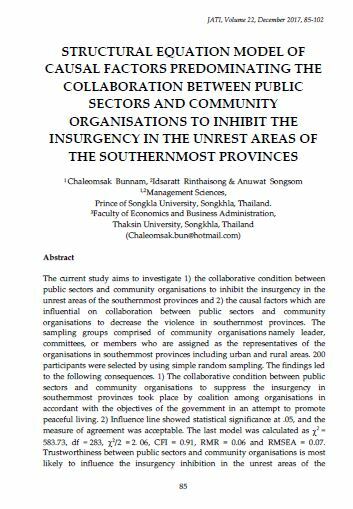 Trustworthiness between public sectors and community organisations is most likely to influence the insurgency inhibition in the unrest areas of the southernmost provinces which is equal 0.77 and followed by communication between public sectors and community organisations at 0.40. BUNNAM, Chaleomsak; RINTHAISONG, Idsaratt; SONGSOM, Anuwat. STRUCTURAL EQUATION MODEL OF CAUSAL FACTORS PREDOMINATING THE COLLABORATION BETWEEN PUBLIC SECTORS AND COMMUNITY ORGANISATIONS TO INHIBIT THE INSURGENCY IN THE UNREST AREAS OF THE SOUTHERNMOST PROVINCES. JATI - JOURNAL OF SOUTHEAST ASIAN STUDIES, [S.l. ], v. 22, n. 1, p. 85-102, dec. 2017. ISSN 2600-8653. Available at: <https://jati.um.edu.my/article/view/10248>. Date accessed: 20 apr. 2019. doi: https://doi.org/10.22452/jati.vol22no1.7. These guidelines are fully consistent with the COPE Principles of Transparency and Best Practice Guidelines and the COPE Code of Conduct (https://publicationethics.org). We encourage the best standards of publication ethics and take all possible of principles of transparency and measures against publication malpractices. The Department of Southeast Asian Studies as the publisher plays its roles of guardianship over all processes of publishing seriously and we perform our ethical and other tasks. Authors should follow the format of reporting the original research with accurate data gathered. The author should include sufficient detail and references to allow others to replicate the work. It is unacceptable if the author performs malpractices in the paper. The authors should ensure that they have produced original papers, and must appropriately cite or quoted if the authors have used the work and words of others. It is an ethical and acceptable for an author to submit or publish same research or manuscripts in more than one journal or primary publication. Authors should cite properly publications that have been influential in determining the nature of the reported work. Those who have made a significant contribution to the paper should be named as an author and co-authors. Those who have participated in the aspects of the research, they should be they should be listed as contributors. All co-authors should have seen and approved the final version of the paper and have agreed to its submission for publication. All authors should include the financier or grant giver if the manuscript or research financed by the research grant or any financial support body. The author is responsible for communicating and co-operating with the editor to retract or correct the paper when a significant error or inaccuracy in his/her published work. The editor should be responsible for deciding which of the articles submitted to the journal should be published. The validation of the work in question and its importance to researchers and readers must always drive such decisions. The editor may be guided by the policies of the journal's editorial board and constrained by such legal requirements, copyright infringement, and plagiarism. The editor may confer with other editors or reviewers in making this decision. All journal's content (articles) are subjected to a double-blind, peer-review process. Articles are first reviewed by editors and may be rejected because it is not dealing with the subject matter. Articles that are found suitable for review are then sent to two experts are unknown to each other in the field of the paper. Reviewers are asked to classify the paper as publishable, publishable with amendments and improvements, or rejected. Reviewer's evaluations normally include the recommendation of what to do with the paper. Reviewer's comments are then seen by the author. Editors should be ready to justify any important points from the described process. Editors should not reverse decisions on publication. Editors should publish guidance to both authors and reviewers on everything that is expected of them. This guidance should be regularly updated and will refer or link this code. The editor should evaluate manuscripts for their intellectual content without regard to race, gender, sexual orientation, religious belief, ethnic origin, citizenship, or political philosophy of the authors. Editors' decision to accept or reject a paper for publication should be based only on the paper's importance, originality and clarity, and the study's relevance to the aim of the journal. Editor and any editorial staff must keep confidential of all information about a submitted and review process of the manuscript to anyone except the corresponding author, reviewers, potential reviewers, other editorial advisers, and the publisher. Authors are freed from fees or charges for manuscript processing. Authors pay neither submission nor publication fee beyond eventual conference registration fee (in case conference paper accepted for publication). The journal is freely available online. Authors are required to agree with this open access policy which enables unrestricted access and reuse of all published articles. The articles are published under the Creative Commons copyright license policy CC-BY. Authors of papers should present an accurate account of the work performed as well as an objective discussion of its significance. Underlying data should be represented accurately in the paper. A paper should contain sufficient detail and references to permit others to replicate the work. Fraudulent or knowingly inaccurate statements constitute unethical behavior and are unacceptable. Review and professional publication articles should also be accurate and objective, and editorial 'opinion' works should be clearly identified as such. The authors should ensure that they have written entirely original works and if the authors have used the work and words of others that this has been appropriately cited or quoted.